I guess I'm late to the party. 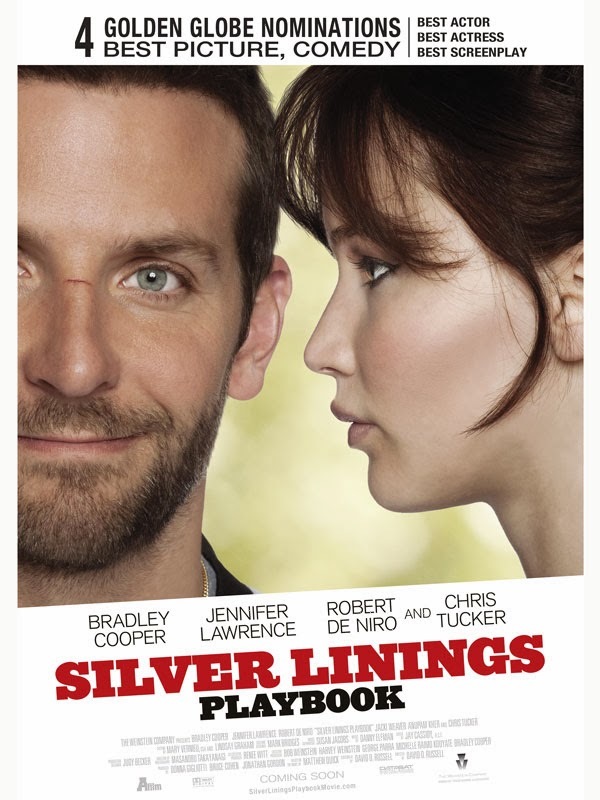 It wasn't until earlier this week that I finally watched the heavily awarded 2012 film Silver Linings Playbook. The small-budget romantic drama by David O. Russell, which premiered at the Toronto International Film Festival and won the People's Choice Award there, has been a big hit all over the world, earning back its budget elevenfold. 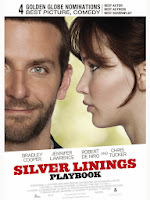 Silver Linings Playbook also cemented Jennifer Lawrence's status as a Hollywood actress to be reckoned with, seeded by Winter's Bone in 2010. Pat Solatano (an impressive Bradley Cooper) is released from a mental institution 8 months after having caught his wife Nikki (Brea Bee) cheating on him and nearly killing the man she was cheating on him with. Determined to get his life back on track, Pat moves back in with his mother (Jacki Weaver) and obsessive-compulsive bookmaking father Pat Sr. (a classic Robert De Niro). At dinner with his friend Ronnie (John Ortiz), Pat meets Ronnie's sister-in-law and recent widow Tiffany Maxwell (a brilliant-beyond-her-years Jennifer Lawrence). The two quickly develop a unique and touching friendship. Wow. I absolutely loved this movie. The delicate story, the wonderful music, the cinematography, the diverse and spot-on cast -- they even dusted off Julia Stiles and Chris Tucker, who aced his performance as Pat's friend Danny McDaniels -- seldom has imperfection been more perfectly captured. Russell truly left the treaded path with this 122-minute beauty, and I can only applaud him for it.